A strategy game where you take the role of the French general Napoleon and his commanders, as they roll over Europe and Africa, conquering territories and defeating enemy armies. Build your army's defenses and capture cities and other buildings to strengthen your position or acquire new units. Taking a port, for example, allows you to build ships and attack the enemy by sea. Each chapter has goal conditions that must be met to move on to the next. 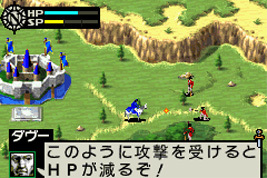 The game supports the Mobile Adapter GB for play over a mobile phone network.